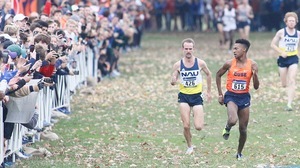 Northern Arizona wins the 2017 DI Men's Cross Country Championship at Tom Sawyer State Park. Syracuse's Justyn Knight took first place in the 10,000 meter race with a time of 29:00. Look back at highlights from both the men's and women's races. What a 2017 cross country championship weekend it was.